With the inclusion of advanced technical knowledge in all our processes, we are manufacturing and supplying a broad range of Wood Tripod Floor Stand. - Use: It is used for office use, room corner, photography etc. DescriptionITEM CODE : RSI001-BRMaximum Height :- 23"
It is use home decorative and office use and corner etc good quality product we have lot of search light. it comes with electric fittings. All work is totally hand made. 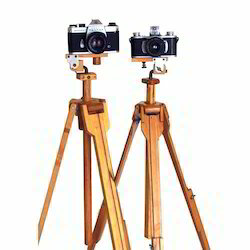 We are counted amongst as the foremost manufacturers, exporters and suppliers of an extensive range of Aluminum Wooden Tripod. 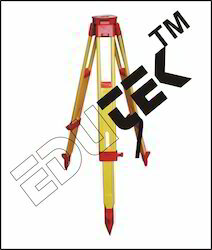 The offered tripods are designed and manufactured as per the international standards using premium quality raw materials and advanced technology. - International Standard, Automatically processed under strict quality control. - Rugged construction with strong specially designed telescopic aluminium/ seasoned wood legs. - Painted with water proof Powder Coated/Enamelled paints.